What's nice in the last quarter of every year is that the cold winds and rain often get families together and bring warm, soul-comforting food on the table. From steamy soups to freshly made hot chocolate smothered with cream and marshmallows, every bit of it makes you want to stay right at home and indulge. My dad's serving hot crab and corn soup for dinner and takeout grilled tuna belly from Bulacan, so I decided to make some spicy lemon garlic shrimp fry for a nice seafood dinner. The large shrimps were bought fresh and alive from the fisherman's wharf yesterday before dawn, when the boats have just arrived. Large tubs teeming with fish, crabs with their pincers tied, and oysters and clams as big as my hand fill the scene. 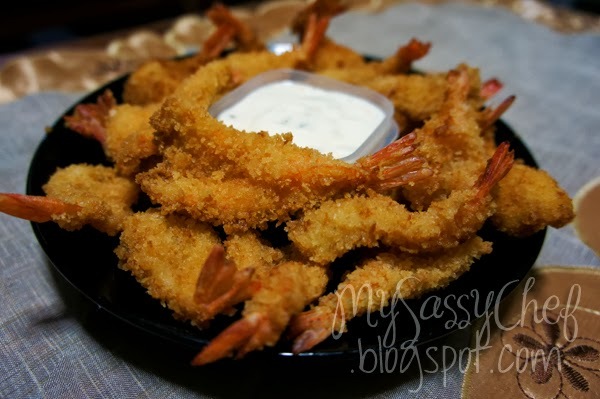 This dish is an upgrade from your average shrimp tempura, where the shelled shrimps are marinated in lemon juice, garlic, and cayenne powder prior to dredging in the panko crust. The result is flavorful and juicy shrimp fritters that's great on its own or with some herbed ranch dip. Wash, peel and take the heads off the shrimp, but leave the tail on. Slit each on the back and take out the vein. Combine lemon juice, garlic powder, salt, and cayenne pepper. Add the shelled shrimps and marinate for 30 minutes in the fridge. Place the flour in a bowl. Beat the egg white and place in another bowl. On a third bowl place the panko. Hold each shrimp by the tail and dredge in flour, then dip in the egg white and roll generously in panko, pressing the crumbs into the shrimp while doing so. Heat vegetable oil in a deep pan and fry the shrimp in batches of 5 to 6 for no more than 1 minute. How Green is Your Cup of Coffee? People nowadays are constantly trying to battle it out with time itself, and with so much ambition and so little time as they say, what would better fuel such determined souls than a steaming cup of coffee? Make that a cup of organic coffee backed by 212 years of expertise in coffee production as well as a drive to increase environmental awareness and help provide work for small communities to thrive, and I'm sure you'd be even more enthusiastic to sip your sleepiness away. 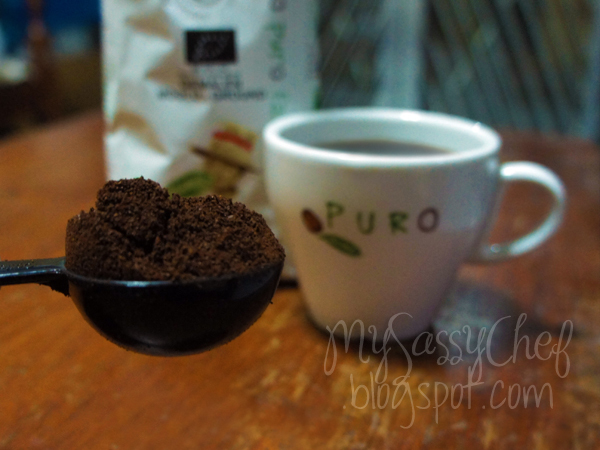 What caught my attention is how Puro Fairtrade Coffee has assisted small farmers in sharing the fruits of their lifelong passion, their trade secrets passed down through generations after generations. As I opened the bag of Puro Organic ground coffee, the aroma was so strong and distinct that my brother eagerly asked if he could have a cup as well, whilst saying how fragrant the coffee was that it filled the room (no kidding). It is a lot milder than the instant ones we usually have, and black coffee lovers may need serious adjustment. I absolutely love how it deviates from the very bitter and strong coffee I used to have, with hints of citrus and a fruity note that blends well with the mild bitterness it provides. From their blends, this one's my favorite. For those who likes a bit more kick to their cuppa joe but is not a fan of full dark roast, the Puro Noble blend may be perfect for you. Just the right amount of body to fully wake your senses but still with a bit of floral notes enough to soothe your nerves. 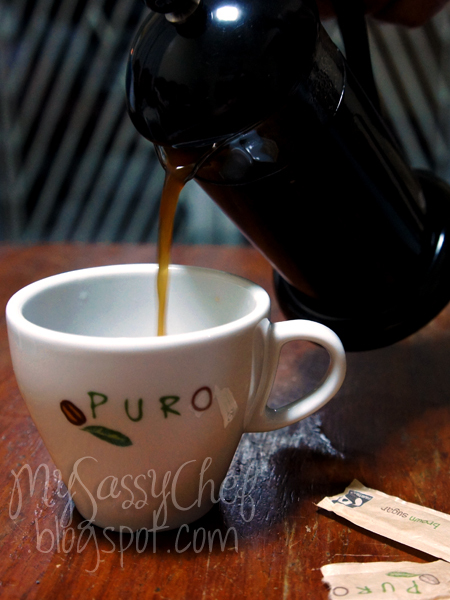 Puro Fuerte, on the other hand, is perfect for those who are constantly looking for an intense caffeine kick and needs to be fully energized quickly. It is robust in flavor, with hints of nutty spice and a hearty, full-bodied roast to get you up and running. The Puro brand under the Miko company assures that their coffee beans are picked, washed, and sun-dried by hand, and that further roasting and packing is done using 100% solar energy. No artificial fertilizers and chemicals were used, and they support their environmental claims fully. They have a rainforest reserve wherein critically endangered plant and animal species thrive, and the company also wishes to communicate the threat to rainforest and the need to preserve it through a wonderfully sweet short film here. To learn more about the company and how they aim to make an impact to preserving our environment, you may visit the Puro Coffee Website. 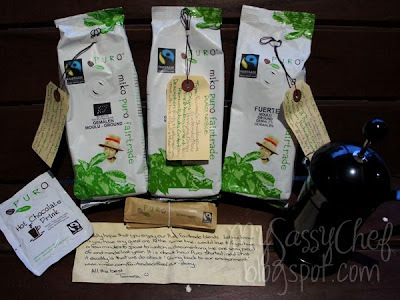 Should you wish to connect with other environmentally friendly coffee lovers out there and get a chance to receive a pack of their goodies like the one pictured above, join their Facebook page here. So how green is your cup of coffee today?